Collection - Site de lejardindemamereeng ! One can find information concerning them on internet sites specializing in roses (Helpmefind.com). Certain names are followed by an asterisk*, which signifies that although they form part of the collection, they can be seen only in the second garden. 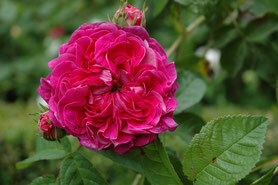 By clicking on the name, a photo of the rose will appear only if the image is of good quality. In the passage of time this work will be competed.